Note: This install occured on a Mac mini. If you are using a Power PC based system, make sure you get the proper version of MySQL. For some reason, MySQL's main page has become nearly unreadable. Therefore, you might find it easier to go straight to the MySQL downloads page. After navigating the myriad of pages necessary to make your final selection regarding which version and platform you will be installing on, you should finally end up on a page that starts the download. Copy the link to your clipboard and use Terminal and ssh to log into the remote Mac. 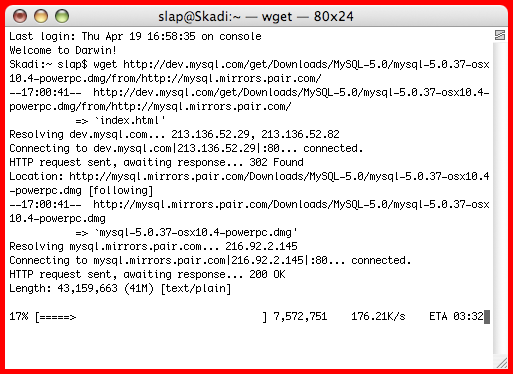 Use wget to download the DMG. If you're familiar with installing software remotely in Mac OS X, you'll recognize the mantra: Mount - Install - Detach. You need to use hdiutil to mount the disk image, installer to install the packages (both the main package and the startup package), and then back to hdiutil to detach the disk image. Commands follow; remember the '$' indicates the shell prompt. $ sudo installer -pkg mysql-5.0.37-osx10.4-i686.pkg -target "/"
$ sudo installer -pkg MySQLStartupItem.pkg -target "/"
MySQLStartupItem.pkg installs in /Library/StartupItems/MySQLCOM. You can start the server manually by issuing sudo /Library/StartupItems/MySQLCOM/MySQLCOM start at the command prompt. To ensure that MySQL starts after a reboot, make sure that /etc/hostconfig contains the line MYSQLCOM=-YES-. If it doesn't, simply edit the file with your preferred text editor, Vim. The MySQL server is up and running, but it has 4 user accounts with empty passwords. The two anonymous accounts aren't necessary, so we'll remove them first. Since we're already in the mysql client, we'll go ahead and use the UPDATE statement to change both root passwords. Be sure to use a secure password for your root. Restart MySQL with sudo /Library/StartupItems/MySQLCOM/MySQLCOM restart and check your work with netstat -an | grep 3306. You should either go immediately to a shell prompt, or see output indicating port 3306 is bound to 127.0.0.1 (127.0.0.1.3306). Your MySQL installation should now be ready for real work. You'll need to go through the process of adding new users and databases as defined by your application. I can't belive that you created all of the function to share this! Awesome. With no Bloggers like you, we would never get so superb information's!